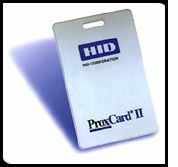 HID 1326 ProxCard II programmed with 36-bit NAPCO propietary format, used by Alarm Lock Trilogy locks and other access systems. Card numbers are managed by NAPCO and non-user customizable. Price per box of 100 cards. Part number AL-HID1326.